It is a perfect time to jump off the interstate after a rock flies off a semi truck landing in our windshield and we see an exit for the Natchez Trace Parkway. The rock smash sounds worse than the quarter size bullseye that was left behind and we are glad to slow down and enjoy this parkway. 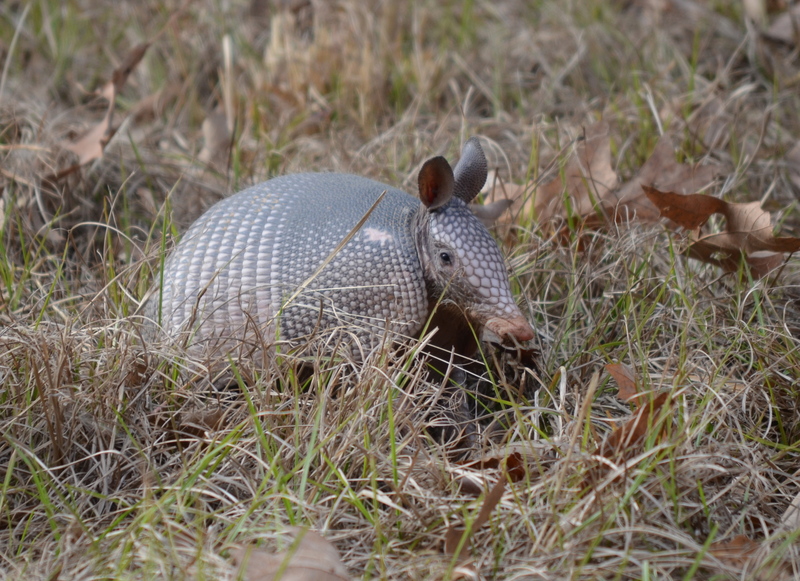 The Trace (as we’ve heard locals call it) runs from Nashville, Tennessee to Natchez, Mississippi and since Natchez is our destination for the day we enjoy slowing down and looking for armadillos. Colin informs me that he has only seen them on the side of the road and dead, but would really like to catch a glimpse of a live one – I couldn’t agree more. As we discuss the live vs the dead the first one is spotted. We’ve got a live one and back up to see him just a digging away. I jump out with my camera asking Colin if it will attack, “not that I know of…probably not.” That’s good enough for me and I’m sneaking up one step at a time, snap a few shots and then get a little closer. He is so busy digging for bugs I have to give a gentle whistle so he can look up and smile for the camera. Cheese! He looks surprised to see me and hops along into the woods. We locate the state park about 10 miles from Natchez and have all day to see the sites. 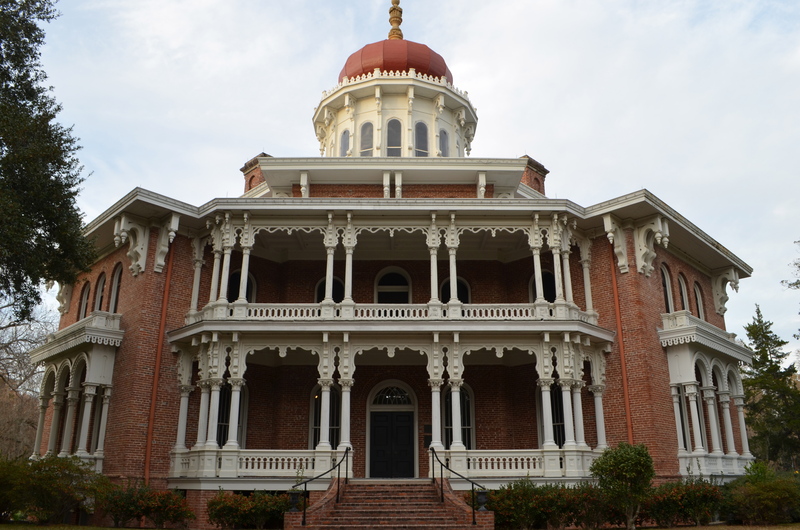 This historic city sits above the mighty Mississippi River right across from Louisiana. We take the self guided walking tour and read all about the pre-civil war history. Tiny brightly painted homes sit along the side streets in the shadows of the more impressive mansions with tall columns and intricate gardens. We find our way over to Longwood Plantation and that’s really when Scarlette starts talking to me. As soon as we pull into the driveway it’s as if we have crossed a timeline. 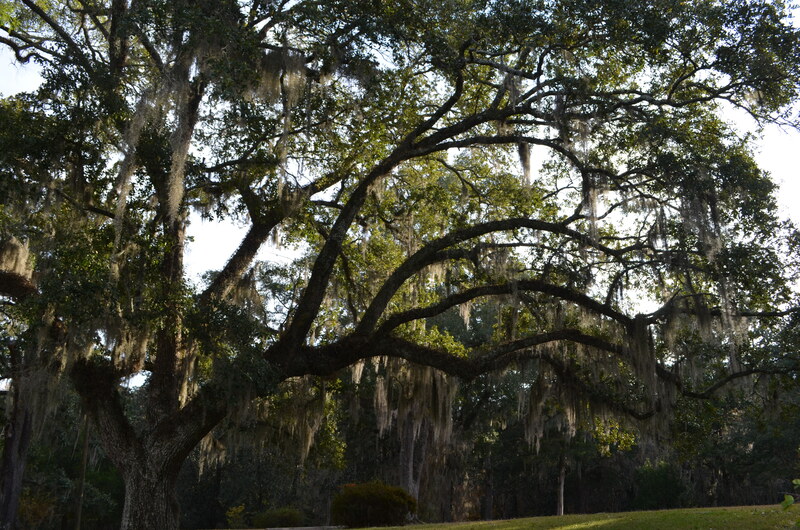 Old oak trees line the road covered with Spanish moss hanging like tinsel at Christmas. We pass a huge pond with reflections of trees and the clouds, more bends and turns and we still can’t see the house until…we see the towering dome that sits on top like a hershey kiss in a red wrapper. 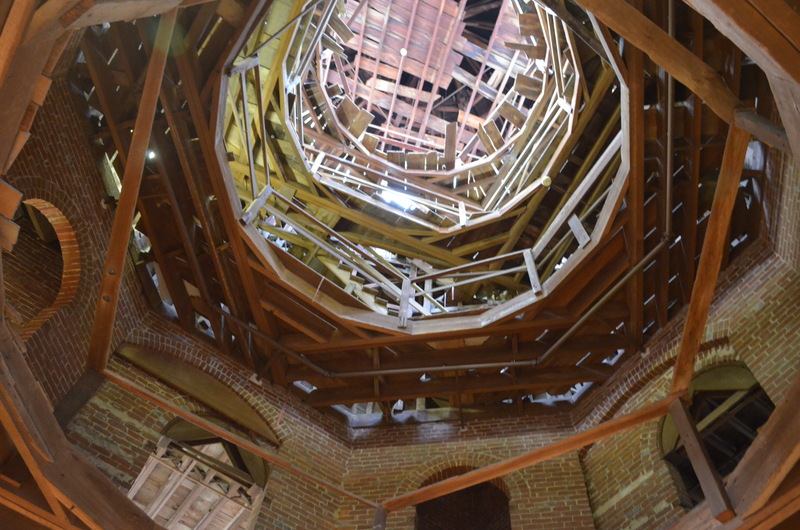 Longwood is the biggest antebellum octagonal mansion in the country. “Biggest” is not the correct word, it is 50,000 SF. I take the tour while Colin decides to walk the grounds with Sprite. The tour starts in the basement and no pictures are allowed until we get to the main part of the house. The tour guide assures us that this policy will all make sense when we go upstairs. I’m thinking what you are thinking “what’s upstairs?” Turns out that the family started building this massive estate right before the civil war. They hired builders from Philadelphia who finished the basement (which is above ground), the entire exterior and supporting walls. The family moved into the basement waiting for the rest of the home to be completed. As the war rumors were heating up the builders got nervous and headed back north. The war started. The cotton was burned. The owners went broke and then the husband died. The house was never finished and remains that way to this day. There are still moving crates sketched with the owners names that remain in the house. The builder’s work benches and masonry tools are still where they left them. It’s immaculate exposed brick work never touched by plaster. It’s an art piece unfinished. I loved it. What we have heard about Natchez is mostly true; the quaint town, the history, the plantations and the biscuit capital of the world. The visitor guide says, do not miss the biscuits while in the famous biscuit capital. It’s the biscuits we couldn’t find. And we looked. We checked restaurants and the local hot spots. We find the Uptown Grocery and ask the sweet lady working at the counter. “I have never heard that we are the biscuit capital of the world…we don’t even have biscuits on our menu.” Then she calls over to the owner who was born and raised in Natchez and he seems confused, “hmmmm, never heard that before.” We order a pimento cheese sandwich with lettuce, tomato and mayo on their homemade sour dough bread and forget all about the biscuits. I am writing this blog from a camp ground in Blanco, Texas, that feels more like an RV resort than a state park. It’s too bad really because the showers are spotless (hardly any spiders) and the folks packed in this place seem nice. We are in an area of Texas called Hill Country which is beautiful and vey unlike the Texas we tend to think of – dry and flat, but really Texas is so much more than that. Just a few days ago we were in Pineywoods Country and constantly on the lookout for alligators. 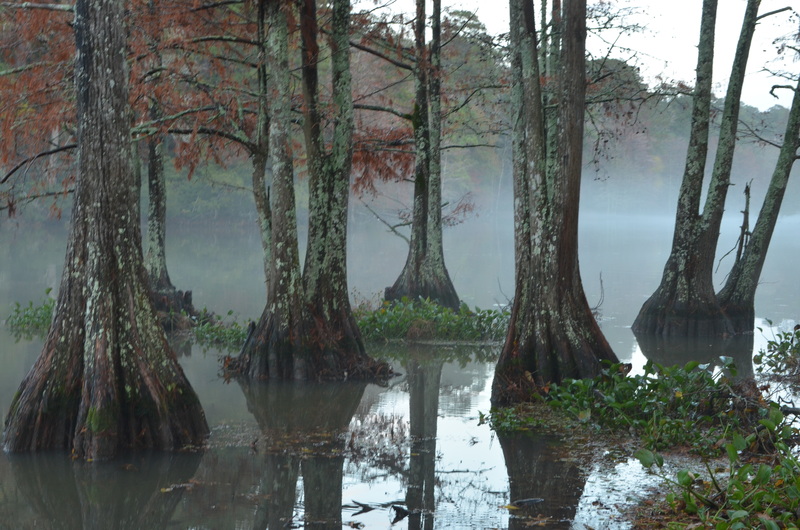 There is a state park just outside Jasper, Texas, that is surrounded by swamp and cypress trees. We set up camp just a few feet from the water. It looked like a gator could walk right up and join us for dinner. More like, take Sprite and head back towards the swamp. 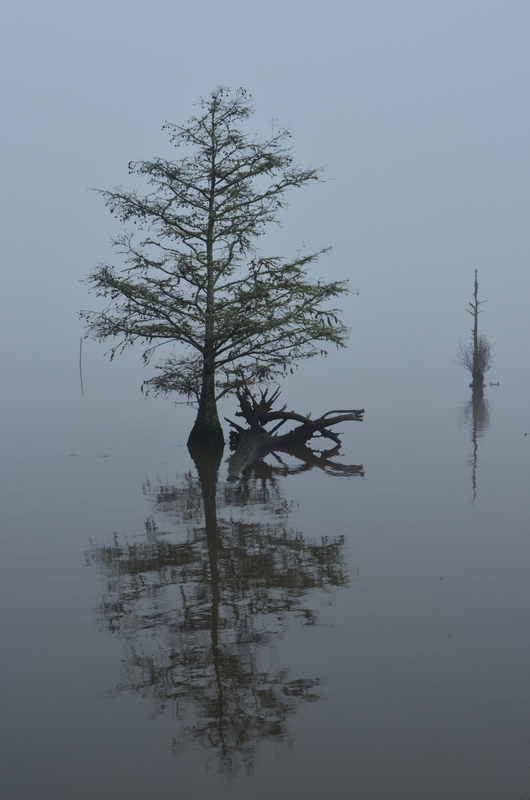 Fog banked down in the morning showing just the trees alone like islands in the water to themselves. It was a sprinkle, and then pour, and then stop, and then start kind of day. During the break we threw on rain coats over backpacks and went on the nature (best chance to see gators) hike. Sprite lead the way (better her than us). We crossed low bridges, made our way through scrubby trees and a trail covered with leaves. Every pool of water we scanned for movement. A few times we jumped back to give space to the log that cruised just at the surface of the water. We called these creatures log-gators. They will not harm you. The next day we are in Austin. We can think of one word besides music – tacos. Tacos and tacos and we eat a lot of tacos. We met up with a local who was born and raised in Austin and Colin hasn’t seem him since they parted ways from the Marine Corps about 22 years ago. He greets us with a big smile and has found a pet friendly place to eat tacos and drink beer called Red’s Porch. Pet friendly which Sprite is only half – she is a pet but not friendly. Sprite impresses us with only two outburst and the place is full of dogs. We enjoy a night of great conversation and really good tacos. We head back through town the next day to duck into Torchy’s Tacos. It’s the place we are always looking for. Neon sign with a chubby baby devil holding a pitch folk and a chalk board listing nothing but tacos and dipping sauces to go. We devour these on a side street in a residential neighborhood and then hit the road towards Blanco. Today marks two weeks and it is going by fast. We started the trip by heading north to West Chester, PA in order to get some parts added to our truck and camper. We headed south through the Carolinas, Georgia, Alabama, Mississippi and now heading west towards Guadalupe Mountains National Park and then who knows! Great to hear from you! We love Austin and could spend a lot more time. Glad we found the good spots!! Seems like there are endless places to eat. We also found Central Market and it puts Whole Foods to shame. We will let you know if we get back to Asheville. Where are you now? Carrie, I luv the way you write. I felt as if I were there with the three of you. I even looked at the floor lookn for log gators. I’m so glad that you’re having the adventure of a lifetime! Hope you find lots of free wi-fi spots to keep us updated. Missing you all but, happy for you. Wow, what an adventure! So, is this blog the draft for your book? I’ll buy it – I feel like I’m right there with you in the fog, looking at a log, falling in a bog, following a dog…enough, you say. I was on a run right then. More writing, please, and thanks ever so much for sharing this wonderful life experience. I think I like being “Anonymous” so will keep that identity for your blog – but will tell you, it’s really me, Linda Holland!! Carrie, We love how you tell a story We feel like we are there with you and Colin. Enjoy your trip and keep the blog going! Great job! It was a pleasure meeting you this weekend Carrie and catching up with Colin after 22 years. I hope we didn’t tell too many Marine stories during our visit. After so long, I still consider Colin a brother. Let me know anytime you are in Texas so we can meet up. There are many more taco and beer joints here to explore! Look forward to reading the upcoming adventures! Colin mentioned what a great birthday he had in Austin with a great friend. Thanks for taking the time to meet up with us. We will definitely call you if we make it back thru. Take care!